Hello everyone...welcome to a new week. I'd thought I'd share our harvest from yesterday. If you are a follower then you'll know we only started the veggie plot back in early February, so we're thrilled with the outcome so far. Here's a quick recap for anyone who may have missed the birth of the plot. In case you can't make out what's in the white bowl... it's blackberries. Have a great week everyone...have fun and keep smiling! That produce looks so good! That's an amazing yield, look at those sting beans or snap peas? I'm never really sure what to do with black berries because they can be so sour. Thanks Jeanna, we're really pleased with all that the new veggie plot has produced. I find if the black berries are not fully ripe they can be a little sour, but they go perfectly in an apple pie or apple crumble...Yum! Which is such a surprise to us Carol. It was just a piece of weed wasteland at the side of our house. 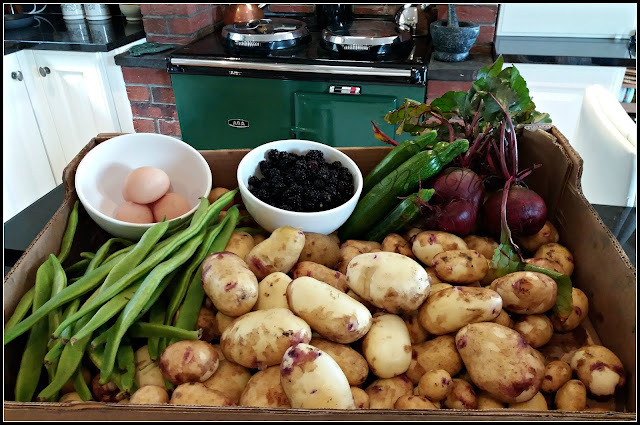 Last February saw it's transformation...and we're loving having so much fresh produce! With autumn just newly arrived it's all go here. There farmer harvested all the fields of barley around us yesterday. It was the perfect day and we saw so much wildlife out enjoying the autumnal sunshine. Oh my - that's a delightful harvest! Isn't it just Sue...we are thrilled that our first year has nearly kept us self sufficient in produce. Only a few failures but I think the weather played a big part in that. It's been rather a wet summer here. Thanks for hosting and I hope you have a great week ahead. I know Rita...not bad eh? Oh my, you lucky girl! Fresh tattoos, eggs, beans and even berries. Those beets will be delicious making Tracey's recipe, roast them, add fresh mint, a little olive oil or butter S&P then add feta. holy heck they're good.Then zucchini chips, make a batter using almond flour and spices, dip rounds in egg wash then dry mix, bake for20 minutes, YUM. I'm coming over for dinner! This was one days harvest Jenn...we've had snap peas, broccoli, cabbage, onions, carrots, parsnips and garlic too! I'll have to give those recipes a whirl. I adore the roasted beetroots! I'll remember to set another place at the table. I normally always have an extra portion left over when I cook. Not sure why but it's a fact! I know Jennifer...it initially was incredibly hard to clear the plot and organise it but it kept my newly retired hubby well occupied. He's been thrilled that we've had such successes. Looks like you are going to have a yummy week! Hi! Nice harvest. You will make delicious dishes! Fresh produce! I think I must raid your house!!! Congratulations for the healthy pick! Blackberries are my favorite berry! How great that you can pick some out of your garden. Yummm!! It takes a lot of hard work to get such beautiful produce - congratulations! Can I come for dinner?